This recipe for Omelettes was submitted by ILoveBagels on 2/7/2005. Click here to view the recipe. Any restaurant menu... you will see diced ham and green bell pepper, that's what make it a Denver. Point blank. Onions need to be in there but it's the ham and bell pepper that go so well together. I actually think this is the best omelet I have seen in a while. I would add mushrooms to mine though and cheese on the top! Delicious. P.S. 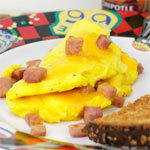 People can be so negative sometimes... go make your own omelet if you don't like this one! It looks good to me! This omelet is a western omelet. The Denver omelet has mushrooms added to it! I think she meant 3 slices. Probably just a typo. Made this with what was in the fridge. Didn't have ham so I used a few breakfast sausage links. Also, used pico de gallo instead of the usual ingredients. The smoked chipotle tobacco sauce made it that much better. Great eggs! Fast. The best. Lovely recipe, but it's not an omelette unless you fill it and fold it. This is a frittata because it doesn't tell you to fold it. I suggest you put the cheese inside, fold it and let the cheese melt. Liked it a lot... skipped the ham because I didn't have any, but did everything else. Lots of flavor. I have one every morning, however I substitute the eggs with egg beaters as it is is much healthier and lo cal - I skip the bacon (yuk), but add diced ham, onion, tomato, green pepper - awesome. I love a good Denver omelet and this came out perfect. A true Denver omelet does NOT have cheese. If it did, it would be a Western omelet. Really good idea for my kids (or maybe just me) for when they're home from a sleep over. Great, but I don't do the bacon and I add some sour cream at the end. Delicious! @JB - It's because he was making a smaller portioned meal. One of my top 5 favorite breakfasts of all time. Interesting how you used sliced ham. I'll have to try that next time. Ummm... the picture has 3 slices of bacon... not 8 pieces... what's up with that? I was raised with bacon, not ham in a Denver Omelet. This is a great recipe because it uses both so should make everyone happy. Very good. 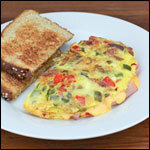 Sort of a meat-lover's Denver omelet with both ham and bacon. The ones at restaurants I go to usually just have ham. I increased the number of eggs to to 6 and didn't change anything else so I could make 3 omelets and it turned out great. I also used a a slice of American cheese for each omelet - half a slice inside and half a slice on top. We made it last weekend, without the bacon and with just green pepper instead of both kinds. Also put sharp Cheddar cheese in the middle. They turned out really good. This is simply awesome. And just because something has bacon added, it doesn't really change it. If anything, it is a Denver Omelet Deluxe. That sounds good. Just don't call it a Denver Omelet. Denver Omelets DO NOT have 8 slices of BACON. Call it something else. Just don't call it a Denver Omelet. I think you mean "until the onions become translucent," not "opaque!" I used chorizo and pancette and added parmesan cheese at the end. Delish! Very good, I like to add ham and mushrooms and some sharp cheddar cheese. On occasion, I also like to mix the vegetables and whatever else to the egg mixture and cook at the same time. Orgasmic good. I was so hungry. Good stuff. Enjoyed this recipe. Only did ham, skipped the bacon, and it was still really good. Super good! Should be called Meat Lovers Denver Omelet. Great with both ham and bacon, but you really only need one to satisfy. I go with bacon. Mmmm. Mmmm. Good. I have to say I'm not a fan of this recipe. It doesn't really turn out good. It may be me though. I wouldn't recommend it really though. Turned out great. Thanks. 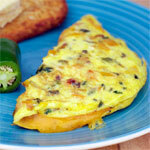 Question: What's the difference between a Denver Omelet and a Farmer's Omelet? Cheese? Any alternatives for vegetarians? Can I omit the ham? I heard people used ketchup instead of hot sauce! Thank u! I do mine with the egg whites for less cholesterol & extra protein. No butter!! You know, I once had a similar omlet made with an Emu egg. It was actually pretty good. We just did this recipe in Nutrition class and it turned out amazing! We won our omelette competition! Does a Denver omelet have cheese? 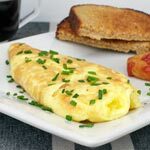 What's the difference between a Denver omelet and an Farmers omelet? Anyway... tried this recipe with grated cheddar cheese and it was great. Made it as directed, but also added a Cheddar Jack cheese blend just before folding the omelet. Thumbs up to the Cheesy Denver Omelet. Good amounts but for some reason I'm picky about having the eggs just mixed in with the rest. Looks better when it's all egg on outside and rest on inside but that requires a much greater amount of skill. Good recipe. I increased the number of eggs to 6 to make four servings. What about some cheese, small bits of Jalapeno, a little bit of salsa? It's dinner time... and I want one of these. Great recipe. I always add a couple of tablespoons of milk to the egg mixture. Makes the final product more fluffy. I was glad to see this. I was recently at a well known Marriott in Plano, Tx where they have a breakfast bar. They also have an omelet bar. The cook did not know how to make a Denver or Southwest omelet. Now I know what to tell him on my next visit. It was awesome for my school report for Colorado. Thanks! Yumm yumm! I love it I love it I LOVE IT!!! My father loves Dever Omeletts, so can't wait to make it for him. He will probally love it. This recipe was delicious! Five eggs!! 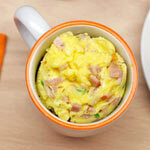 Add 4 Tablespoons of good beer to the egg mixture for a lighter, fluffier, tastier omelette.